How much for The Town Talk? It’s been an institution in our community since 1883. When you bought The Town Talk (and Central Newspapers) nine years ago, after it had been purchased by Central Newspapers in 1996 for $62 million in cash, you also bought a printing division known as McCormick Graphics, another institution in our community, named after the founder of The Town Talk, Edgar McCormick. Great brands with great name recognition and a relatively stable region of consumers. A regional newspaper monopoly, which is what, at the time, made your decision so obvious. After all, you specialize in mid-sized markets featuring only one or two dominant media outlets. In my opinion, you’re struggling here because of the exponential proliferation of the Internet (and your overall reluctance to participate or understand how to translate your product online; your forum is an example of the absolute worst kind of hybridization, “serious” journalism succumbing to contextualization by a random group of anonymous and often ignorant contributors, whose comments are rarely, if ever, checked for facts or accuracy)… and you’re struggling because of your decision to run a local, home-grown newspaper as if it could ever be an asset that could yield a 30+% return to corporate. You can dance around it; you can pretend as if you’re still a local paper with local folks delivering the local news. But, at the end of the day, you have to ship away a chunk of your profit margin here in Central Louisiana to your national offices in Virginia. (And, by the way, USA Today is still looking good). When the output of your editorial writers and letter writers exceeds or nearly equals the production of the LOCAL news desk (and when your forum contributors are the MOST prolific of all), the problem becomes even more obvious: Opinions, after all, are cheap, but reporting the news is what makes a newspaper a newspaper. And sometimes, the news is bleak. There is a model for what Gannett is doing in Alexandria (closing the printing plant). It is the Opelousas Daily World, which Gannett scooped up a few years ago to undercut any idea of competition in their market. Like McCormick Graphics, the Daily World had a history. It was the first daily offset newspaper in the United States when its publisher John Thistlethwaite made that (then) huge investment back in the 1930s (right, The Depression — but he knew his community). After Gannett purchased the Daily World the first big change was that printing plant in Opelousas was closed. The Daily Advertiser became the Sunday edition of The Daily World. The size of the staff and the paper continued to shrink as Gannett sought ‘efficiencies’. Last fall, a member of a local committee working to organize a candidate forum in a special election here in Lafayette, called the Daily World to see if they would like to send a reporter. The word was that there was no reporter to spare, that the paper had been “Gannetted” (their words), they couldn’t spare a reporter to send. The Daily World has left the building it had operated in for about the past 40 years and is operating out of a small office somewhere in Opelousas. The same thing will happen to the Town Talk. 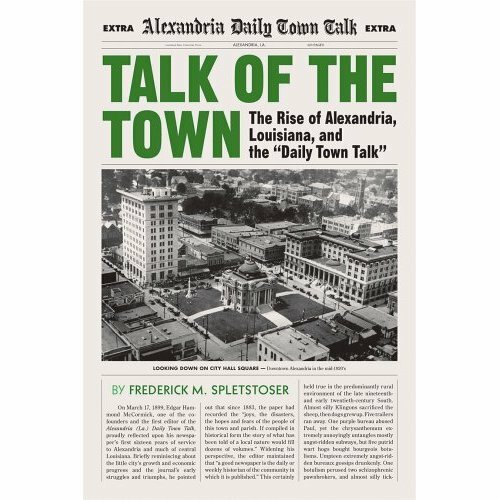 The value of the paper to the community will diminish right along with Gannett’s willingness to invest in Alexandria. Deadlines will be very early. Local government coverage will suffer as a result. Sports coverage will suffer. People will have to turn to other sources for news about Alexandria and CENLA. Gannett’s only interest in CENLA consists of the ad revenue it can squeeze out of the region before it completely abandons it. So, Gannett has followed Cox in deciding that Alexandria and CENLA are not worthy of their investment dollars. Like Gannett, SuddenLink is milking the market for all it can without making any new investments in it. At some point years ago, Alexandria came to a similar crossroads when investor-owned utilities were not willing to invest in the city. The city formed its own utility company. A similar sequence of events happened in Lafayette more than a century ago. In this century, when giant media companies decided they were not willing to invest in our community to give us the tools we felt we needed to build a competitive 21st Century city, we used our utility system to invest in those technologies on our own. Alexandria and all of Central Louisiana will now have to decide if they believe in themselves enough to invest in themselves. It’s clear the big boys have written y’all off. Like I posted on the TT forums….if Gannett wants money, Please just put the Town Talk up for sale and let us have our paper back! I suspect, and please know that I know nothing about the newspaper business, that a community owned paper would flourish. A paper that, like a co-op, answers to the community owners and readers, not a huge corporation. I also suspect that the talent, at all levels, needed to run such a paper is here. Sadly, the initial funding and startup is probably not. 1. Central Newspapers Inc., formerly owned by former U.S. Vice President Dan Quayle, purchased The Town Talk and McCormick Graphics on March 12, 1996. 2. Gannett Co., publisher of USA Today and the nation’s largest newspaper group, acquired Central Newspapers Inc. — and thereby The Town Talk and McCormick Graphics — in June 2000. 3. The price, $2.6 billion for all Central Newspaper holdings not just The Town Talk, was the second-highest paid for a newspaper company. So technically, it only took Gannett about nine years to shutter McCormick Graphics and make The Town Talk a bureau with about 30 IT, news and advertising staffers. While you utilize newspaper carriers to drive home a point, the problem, yet again, is that they aren’t employees. Newspaper carriers are independent contractors, and that’s universal throughout the newspaper publishing industry. [In 1998, the U.S. 10th Circuit Court of Appeals ruled that newspaper carriers for the Kansas City Star were not entitled to be paid as employees because they had signed contracts to work as independent contractors.] So it is the carrier’s responsibility to see that the route is delivered every day and that he/she find his/her own substitute when necessary. And the “plan” started more than a year ago. For those who weren’t paying attention, the plan to decimate The Town Talk started when Gannett purchased CNI’s holdings. Two years later, it tossed out its tenured executive editor and replaced him with Paul Carty, who commenced to drumming out long-term employees in favor of extremely inexperienced or completely inept journalists. Just take a look at who’s left. And for those who ignore history, Gannett did the same thing to the Arkansas Gazette, the oldest newspaper west of the Mississippi, when it shuttered the Old Gray Lady’s doors in 1991. Eliza, duly noted. Obviously, the link I provided reports that Central Newspapers purchased the paper. I did not note that Gannett, four years later, then purchased Central. Thank you for taking the time to point that out. That said, Dan Quayle actually resigned from Central’s board prior to it being purchased by Gannett. Also, please explain how this “weakens” the thesis. I also don’t see how that weakens anything…for that matter I didn’t even realize there was much of a thesis to begin with. A few things remain. First that a Town Talk from 5 years ago is 5 times as thick as one from today and one from 15 years ago is 5 times as thick as that. Also, the Lafayette Daily Advertiser (also owned by Gannett) is actually still as thick as ever showing that Gannett simply chooses which communities merit a good paper and which are only good for ad sales. Second, local newspapers can be quite profitable. In the New Orleans and Baton Rouge the Times-Pic and Advocate are quite successful and still faithfully serve their communities. Even for small towns, a company called Home Town News publishes papers (for free with home delivery) all around the country. They sell local advertising cheaper than Gannett. They hire local writers and journalists (probably former Gannett employees) and they put out a decent paper funded purely by their ad sales. And…they make a profit. Are print newspapers, and their consequent staff, already obsolete? Other than “Stars and Stripes” and complimentary “USA Today” during hotel stays, I’ve probably read fewer than 15 newspapers in 15 years. As a kid, I used to read “The Town Talk” from cover to cover. I’m not sure if any business model will keep newspapers as viable, for-profit entities. I’ve been wrong before – I assumed that Fedex/UPS would have defeated the USPS by now, even with government backing, owing to the rise of email and electronic communication. It’s still going to happen (the demise of the USPS), but it is going to take longer than I thought. Having said that, I think newspapers have about 5 years left. I don’t think Newspapers will be gone in years, but I do think Newspaper conglomerates probably will. I think what you’ll find are one or two Newspapers taking over in each region where they may currently be 10 or 20. You’ll also likely see the rise of evening papers and once per week magazines coming in. Part of the problem with Newspapers has been Gannett and a few other large companies which have lost their local focus and waged a virtual war against new media — blogs especially. Other papers like the Times-Pic, the Washington Post, and the NY Times have embraced the internet and wrapped it into their business model. Those papers will do fine. When companies like Gannett buy a print asset, they are not buying its community ties (nor do they care to). They are buying its circulation and the market share that circulation reaches for the purposes of ad sales. You can’t be a community resource if you have no ties or vested interest in that community. Gannett has shown this to be the case, and their reward will eventually be the demise of their company. Sadly that demise will likely leave communities such as Cenla without a newspaper to serve them.